Marvel at the legendary skyline of the old city. Watch how sunset works its magic, creating the legendary golden city. All this in one remarkable venue - the King David, a Jerusalem landmark and perennial host to world leaders and celebrities. A stately building standing in extensive private gardens, the superbly located hotel overlooks the famous old city, and is within walking distance of major historic sites and the capital's newest commercial centers. 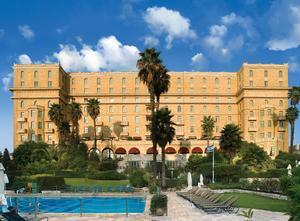 Graced by spacious public areas and luxurious guestrooms, the King David is renowned for its elegance ad gracious hospitality. Standard rooms floors 1-4, facing the new city. Deluxe new city rooms floors 1-6, facing the new city, some with balconies. Deluxe old city rooms floors 1-6, facing the old city, spacious and comfortable, some with balconies. 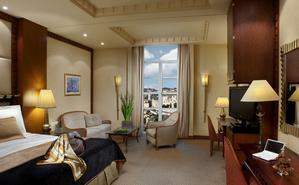 Executive Old City Rooms located on floors 5 and 6 with magnificent views of the Old City and the King David gardens; very spacious room with the sleeping area screened from the living room. Wireless internet access - high speed (WI-FI) in rooms and public areas. Dial up via an extra telephone line. Non-Smoking Rooms. Situated in the center of the city. Historic building with modern facilities. Walking distance to old & new city.
" 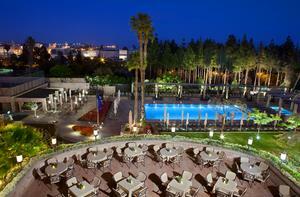 This was my third trip to the King David Hotel and it was, like the previous two, a wonder..."